KASABIAN Announce UK Arena Tour - Tickets Available Friday 2nd Sept from Our Website! The gargantuan Kasabian take their even bigger ‘Velociraptor!’ LP on the road this winter for a 10-date tour, flexing their muscles in some of the country’s best arenas. Due to phenomenal demand, extra dats have been added at Nottingham & London. Tickets go on sale Friday 2nd September at 9am from See Tickets / Ticketmaster / www.livenation.co.uk. Tickets are priced at £30.00 (£32.50 for London). One of the year’s most eagerly awaited LP releases, ‘Velociraptor!’, is out September 19th through Columbia and includes stompers ‘Switchblade Smiles’ and ‘Days Are Forgotten’. The band have been wracking up those youtube hits for the ‘Switchblade Smiles’ video and ‘Days Are Forgotten’ has already been chosen as the soundbed for the new Sky Sports football season TV ad. 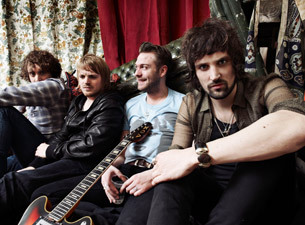 Kasabian are guitarist Sergio Pizzorno, singer Tom Meighan, bassist Chris Edwards and drummer Ian Matthews.